For handling quality studies, mass distribution & inertia the saiplane are part of the eigen modes solutions. It is nevertheless very difficult to access such data among existing sailplanes. Here is a simple spreadsheet tool that evaluate inertia of a wing on main axes (Ixx, Izz, Iyy) . Some simplifying hypothesis are made (wing seen as a beam, simplified mass distribution, etc), in order to be able to evaluate realistic values of inertia. Simplifying hypothesis are made about how to spread/share thoses mass along span & chord. The effects of filling tanks is also evaluated, once again with some hypothesis. Similar modeling will be needed for fuselage. If you happen to have data on sailplane inertia, just tell me ! This is winter, right time for reviewing the outcome of 2007 flying season. Approx 50h logged in the LS6: this year was a quite disappointing season, partly due to weather situation this summer. Here is a general view of cross country flights performed with AD. Best performance was 360km. I am still not a big champion, nevertheless I do like those rides a lot ! I am "opening" the LS6 for checking purpose. This is the first time I work on a flapped sailplane, so I watch carefully how it is done ! Once removing the seat, here is a general view of all the cranks and tubing from the stick, AB & flaps levers. Then a detail over stick area, with the big green trimm wheel. As I wrote, a lot of things have started for me with models. Eloïse (so is she named) is in good health, as is her mother ! Do not use flap -5 before 150kph ! I am collecting as much technical information as possible about my glider type. 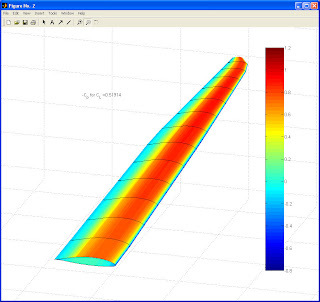 The objective is for me to test available tools for aerodynamic computaton and prediction on a precise book case. I base my study on on LS6 measured planform and wing airfoils. The geometry of LS6 wing have been translated for MIAReX, my tool coupling lifting line theory and Xfoil results. The final objective is to test how accurate such a tool could be at predicting the speed polar, and have a first hestimate of non linear behavior of the wing for handling quality evaluation. I have also been preparing the formated file for having the complete saiplane geometry of LS6 available in AVL. The objective is to be able to study the rigid, linear handling quality of the LS6 glider over its flight domain. Using those tools, I hope to progress in the understanding and prediction of the aerodynamic of sailplanes, and mine in the first place !